Alexander Maybaum was born in Westphalia, Germany, February 11th 1849, and came to America when thirteen years of age. In Newark, N. J. which became his residence, he continued the education commenced in the schools of Germany. Complying with the wishes of his natural guardians he learned the trade of a butcher, and soon after reaching his majority entered thereupon for a living. Prudence, industry and uprightness combined to give success to his enterprise, and his wholesale establishment became the largest in the County of Essex, N. J. He has increased from year to year, and, notwithstanding the opposition of the great Western beef trusts, his success is all that he could desire. Mr. Maybaum enjoys an enviable reputation as a highly intelligent and public-spirited man, and has many times been called upon to take an important part in the affairs of the county. Several times he served as a member of the Essex County Board of Free­holders, and as a member of the South Orange Township Committee. He was the leading spirit in the movement to give to Vailsburg, his place of residence, a borough form of government. The movement met with a great deal of opposition on the part of the leading politicians of South Orange, who did not regard with favor the cutting off from the township such an important village as Vailsburg. But by perseverance and incessant work, Mr. Maybaum finally succeeded in having the village made into a borough. Naturally he was selected to stand for the office of Mayor, and he was elected to the chief magistracy without opposition. He has been, since his election, the life and ruling spirit of the borough government. His suggestions for its improvement have generally met with the favor of the residents, irrespective of party. He has great faith in the future of Vailsburg as a place of residence, and has striven to make it equal, to any of the surrounding townships in the character of its improvements. Through his instrumentality a new Borough Hall was erected, sewers were constructed, streets laid out, water supply bargained for, and many other things conducive to the welfare of the place have been set on foot until the borough has become known as one of the most progressive places in the county. Mayor Maybaum is a prominent member of the Progress and Jeffersonian Clubs of Newark. He also holds membership in the Odd Fellows, Knights of Honor and several other associations. 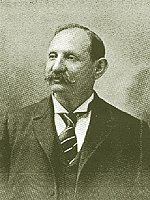 He was a candidate before the Democratic convention for Congressman from the Eighth District in 1892 and failed to receive the nomination by only one vote. On January 25th 1874, he was married to Mary Stein, by whom he has six children.